I like the firefly! Cool round version of the original. Rockford's head now looks a bit flat with the bleu line around his neck. for compare rockford to original. has pronounced blue trousers, neck, sox, has the antenna on the head when it runs like when do not move, still T-shirt with stripes.. overall, it is smoother. titanium walls. best looking for me from view to whole concept is the enhanced version with color 1. original is very flat. and it's a matter of color palette choice how the cave, walls, rocks, dirt looks. I meant my last remark differently. A designer of caves has freedom to set colors. So color 1 can be darker than color 2 or vice versa. I wonder how your designs look when all pink becomes blue and all blue becomes pink. In particular, the (blue) shades around Rockfords head. When blue and pink are reversed, these won't look like shades anymore, right? A designer of caves has freedom to set colors. So color 1 can be darker than color 2 or vice versa. That's also an issue with the original charset. It is clearly designed with certain steps in brightness. Especially the original diamond and butterfly stripes aren't at all smooth when the colors are swapped. That's why I changed the colors in my version of the Enemydesigner to match the brightness order of the original Boulder Dash. Also my Crazy Light Construction Kit honors this order of brightness when you create a new cave or when you let it choose some random colors. I second this. The original animation seems smoother to me. So far, amoeba, dirt, walls, fireflies, butterflies and diamonds look fantastic, imho. But I liked the earlier titanium wall design without the holes better. Those solid rock walls indicating more resistance then the brick walls, which is the whole point, I think. Putting holes in it looks ugly, imho. yes, colors with detailed graphics must be selected carefully. therefore is brightest color char color (one of the low eighths), multicolor 1 medium color and multicolor 2 dark color. this must always be respected. also because of shadowing. i saw on youtube a lot of boulder dash versions and in many cases cave colors was terrible. it did not look so good. That's also an issue with the original charset. It is clearly designed with certain steps in brightness. Especially the original diamond and butterfly stripes aren't at all smooth when the colors are swapped. 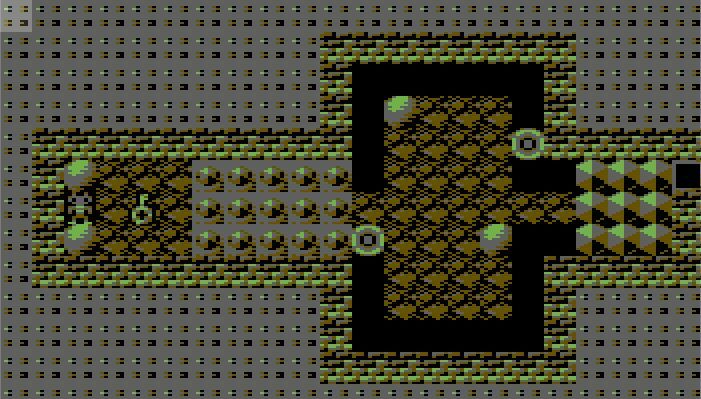 Well, in C64 (fanmade) BD caves it is quite common that the titan.wall color is darker than the dirt color. That's why I wondered if netoper aimed at supporting those color schemes. 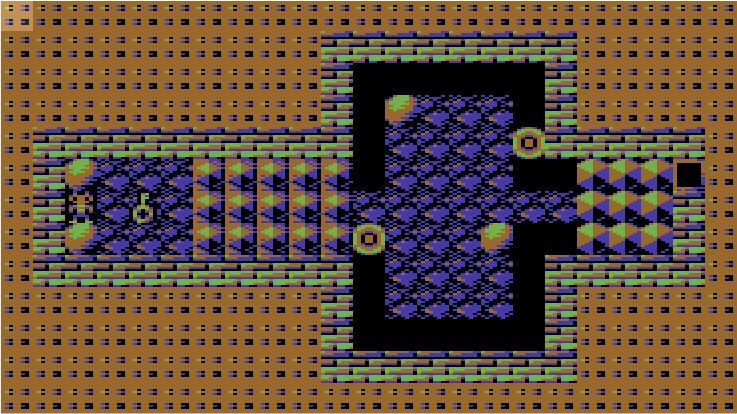 For instance, the C64 port of the original Boulder Dash has broken the brightness "rule" (see cave A as an example, where the titan.wall is dark grey and the dirt is light brown / orange). Less common are dark wall/amoeba or light background, and this indeed gives horrible cave colors sometimes. I haven't checked if the original Atari BD version does respect the brightness steps, but it could well be. The rule of original Boulder Dash is: amoeba always goes dark green and slime goes dark blue. 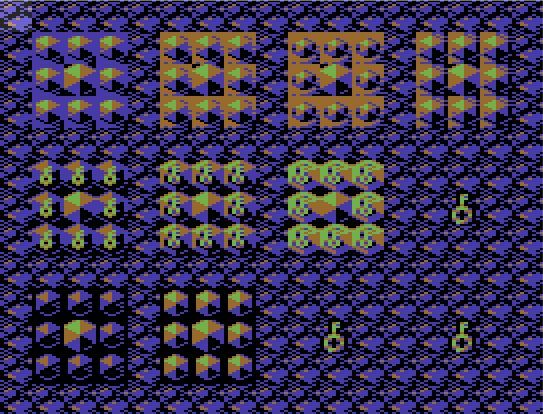 Since the c64 doesn't have the same char mode which can set a separate amoeba/slime color just by setting a char attribute, they decided to set the walls dark green with it in all amoeba caves in BD1. They used a brighter wall color in all other caves. The CPU time wasn't sufficient to write all the color RAM, so they abandoned that idea, too. In BD2, they did a different approach to "solve" this. They invented the dirt mod, ie. they changed the amoeba/slime color to the main dirt color, and to make it more distinguishable, they swapped the dirt colors in all amoeba caves. The issue with that is they sacrificed dirt contrast to the boulders and titanium walls, which is why many fans didn't like that, but No One and Prof. Knibble obviously did, though. 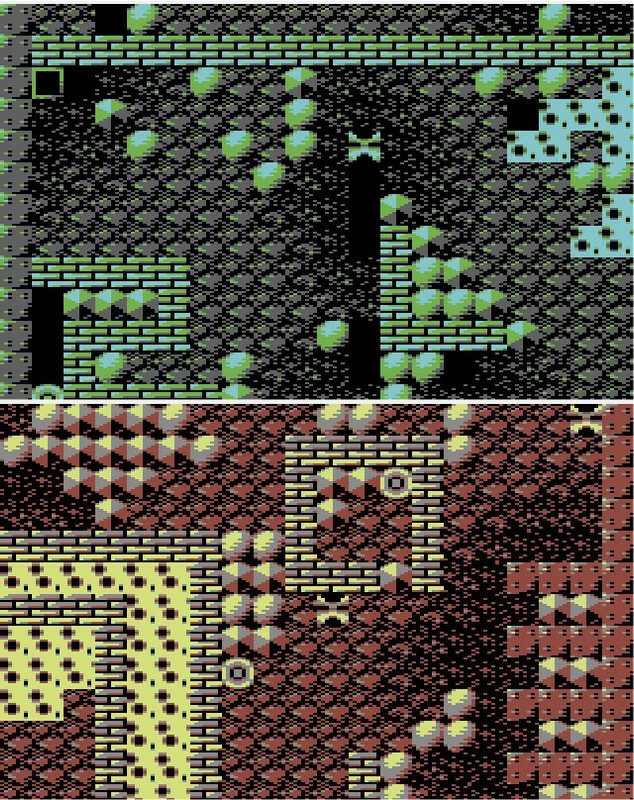 Even worse, Prof. Knibble forced the low contrast dirt for all caves in some games. I changed it back to the original dirt colors in my Deluxe Construction Kit since v2.6, and I also changed the amoeba graphics to the BD1 one and the slime graphics to the BD2 version at the same time, to give new games a more classic and more colorful appearance. Also, to understand some limitations, another rule of original Boulder Dash was: no amoeba and slime in the same cave. This is because they share the same graphics, and it wasn't possible to give them different colors in the same cave. They even forced the official Construction Kit to only use one of them, eventhough the engine has no problem having both elements in the same caves. And infact, many caves made with hacked Construction Kits (or by exploiting glitches) did just that. That would require a massive engine reorganization. So it won't happen. The closest to this is XDC's ability to have both dirt versions (original and swapped color version) in the same cave, to give it some diversity. That's about it. I ran out of tiles, so there will be no features requiring additional graphics. - Fix Crazy Light Tools for JiffyDOS. - Finish XDC some day. then use them in one level is no problem. for amoeba and slime i use different color and animation. That is possible since the 1stB engine. Prof. Knibble made it a separate set, so amoeba and slime no longer share the same graphics. Btw., the locked diamonds are blast resistant. So maybe your graphics for them should look somewhat more robust. EDIT: one question for Crazy Light Tools. is here some key shortcuts for select elements? or do i still have to choose it from menu? i try every key but only few keys make something. i tried SHIFT + 1..0 but nothing was happen, F keys nothing too. acid test.. i never seen it in action before. great element! one question for Crazy Light Tools. is here some key shortcuts for select elements? or do i still have to choose it from menu? The menu it is. Are you using a mouse already? With a mouse, you can work significantly faster than with a joystick for sure. is there a way to get the map from the charpad (i can export map bin data) to deluxe kit v3.0? on which $adress starting map data ($7010 - $737f(?) i can load exported data to memory via winvice monitor)? or with help from GDash.